Shipping and handling charges depend on amount of product ordered, length of time in transit, type of shipping method <ground, home delivery, express> and distance from southern California. Unfortunately, our shipping prices have increased as of March 2014. Our flat-rate charge is currently $25. If the shipping & packaging fees are less than $25, we will happily refund you the difference directly to your credit card through Pay-Pal. Please contact us directly for accurate quotes. Please note: If you delivery address in the Santa Clarita or San Fernando Valleys <California>, we will deliver your order free of charge with a minimum order of $20 & $30, respectively. If you live in the AV (Antelope Valley), we have truffles boxes available at AV Winery. What does your handling fee account for? Truffles ‘N’ Toffee uses ice bricks when packing your order to ensure you receive it in the intended condition. We use NO preservatives or stabilizers in our chocolates, which makes them temperature-sensitive. We take every effort to preserve the quality of our products. Once you taste our chocolates, you will thank us. Please keep and re-use your ice bricks; they are great for packing a lunch or keeping drinks cold. How do you ship your chocolates? We use FedEx Ground, FedEx Home Delivery & FedEx Express services. We also use the US Postal Service in cooler months; depending on the size of your order and the delivery address, this service can be less expensive and faster than FedEx. What if I want my chocolates shipped overnight or 2-day? Please don’t hesitate to email us and request expedited shipping. In cooler months, we can get your chocolates to you within 2 days depending on the size of your order; please keep in mind that larger orders don’t necessarily mean cheaper rates. Will you ship my order immediately? All chocolates are made weekly, and we only ship on Mondays and Tuesdays. This guarantees you get the freshest product available. Do you ship in the warmer months? We do not. Unless overnight shipping is requested, we cannot guarantee the quality of our products upon arrival. What is the last shipping date for holiday orders? For areas indicated by the colors orange, green & purple, December 15th and 16th will be our final shipping days before Christmas. 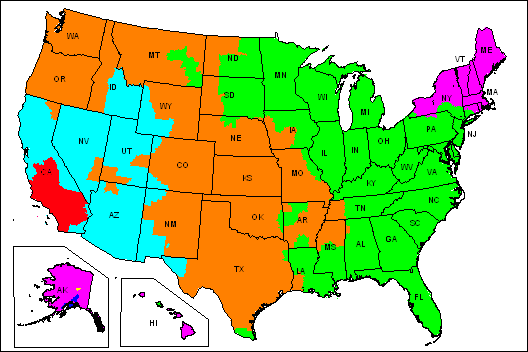 For red and blue areas, we may ship as late as December 17th in order to accommodate the holiday rush. If you are local to the Santa Clarita, San Fernando, or Antelope Valleys, we can deliver your order up to the day before Christmas. Yes. The summer months are a time when we try new recipes for the upcoming year, but we are still open and offer our full line of products. Our Fall & Spring Lines are generally up and running in late September & late January/early February, respectively. You may notice that some of our Fall & Spring truffle flavors will be changed from the previous year. Once our tasting panels approve our Fall & Spring truffle flavors, we will release them here. We can tell you that we will be offering a few more holiday flavors in the new Fall Line and some new flavors in the Spring Line. We are generally closed from December 24th through the end January so that our employees may spend time with their families and in preparation of getting our Spring line up and running. Any orders placed during this time will ship out in early February pending availability; please contact us if you are ordering during this timeframe. If you would like your order shipped in time for New Years, please contact us ahead of time; we will be happy to accommodate your needs. We will ship your order the following Monday or Tuesday after you place your order. Below is the FedEx Ground map showing how long it will take to get to your doorstep depending on what state you live in. Please note that shipments to Alaska and Hawaii are considerably more expensive and may require additional funds to complete your transaction.